Director Elia Kazan's take on Tennessee Williams' ribald tale of a Mississippi child bride and the two men who lust after her was scandalous in its time, and is still steamy today. 1956, USA, 114 minutes, 35mm! Director Elia Kazan’s 1956 take on Tennessee Williams’ ribald tale of a Mississippi child bride and the two men who lust after her was scandalous in its time, and is still steamy today. Times are tough for cotton-miller Archie (Karl Malden) but at least he has his child-bride (Carroll Baker), who’ll soon be his wife in title and truth. The one-year agreement keeping them under the same roof—yet never in the same bed—is about to end. But a game with a sly business rival (Eli Wallach) is about to begin. 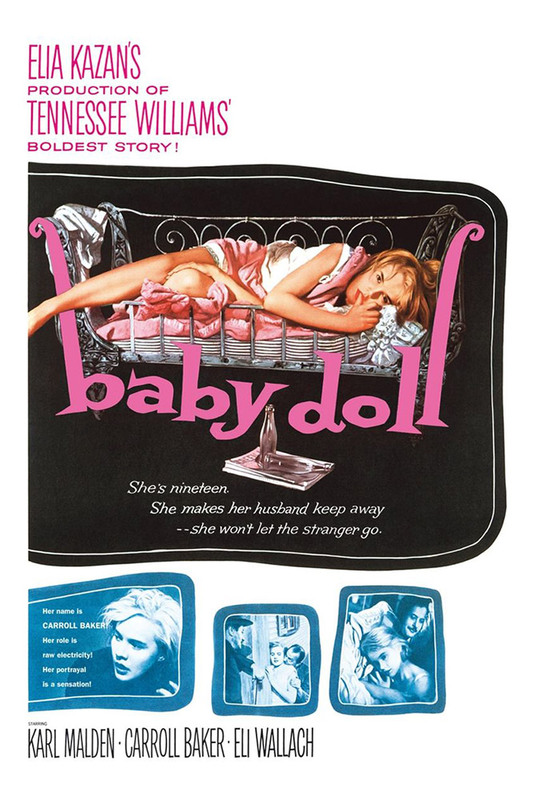 In Baby Doll, as in A Streetcar Named Desire, director Elia Kazan and writer Tennessee Williams broke new ground in depicting sexual situations — earning condemnation by the then-powerful Legion of Decency. They also earned laurels too: four Academy Award nominations, Golden Globe Awards for Baker and Kazan and a British Academy Award for Wallach.